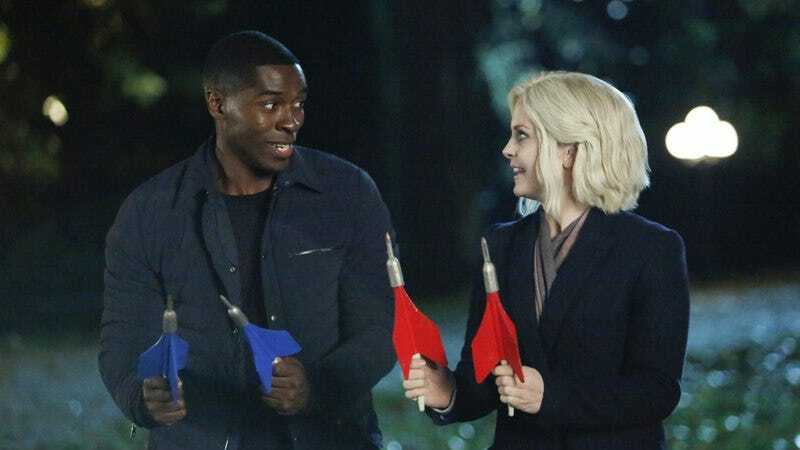 Sometimes iZombie is so jam packed that it feels like the writers have a wager to see just how many things they can fit into the episode before it totally collapses. “Eat A Knievel” is crammed to the gills with plot, yet mostly manages to make it all fit together into a cohesive, entertaining episode that feels effortless. It helps that the episode features the return of bad guy Blaine, and the second he’s back it’s obvious just how much that presence was missed. From the opening scene where he forces his old client to turn him back into a zombie, until the final scene where he forces his way back into the brain business with Don E, everything about Blaine’s story is a delight. If it took getting shot in the gut by one of his father’s stooges to knock him out of his Peyton-induced funk, more power to that stooge for doing it. Blaine’s father certainly got what was coming to him in the cruelest (and most satisfying) way, as Blaine Trojan Horses his way into The Scratching Post, takes his father hostage, then puts some cement shoes on him and puts him at the bottom of a well. Literally. Blaine’s father is a horrible, horrible person, and Blaine so obviously relishes finally being able to get his revenge, that the whole thing is a pleasure. Blaine’s return also hints at an interesting future story for Blaine and Don E’s new partnership, as Blaine seems poised to attempt to somehow become the brain supplier for Fillmore Graves. Intertwining stories when there are so many different story threads happening simultaneously is a good thing. The other major plot development this week is that Fillmore Graves’ leader, Vivian Stoll, is no more. This is both maddening and exciting, because her replacement is Vivian’s brother-in-law Chase Graves, who is played by Veronica Mars’ Jason Dohring. The maddening part is that Vivian didn’t get much to do in the episodes leading up to her death, and what she did get to do in this episode immediately had me realizing just how well her presence fit into the show. To have her figure out Major’s secret and then immediately get blown up is a bit of an eye-rolling development, but one that’s so common in television writing shorthand that it’s easy enough to let slide. When Chase arrives at the end of the episode, it’s clear that Fillmore Graves’ mission is likely to become much more extreme than Vivian was handling it, as Chase is a gung-ho, survival-of-the-species-over-everything-else, military guy who will tolerate nothing else. Seeing how he interacts with Major—and how Major will keep his secret—is certainly intriguing, not to mention how he we handle hearing about the anti-zombie conspiracy theorists who now have Justin’s full-on zombie mode freak out posted on YouTube. The case of the week this week worked better than the last few as well, partly because Liv was pretty hilarious on “Finn Vincible’s” Jackass-stunt-guy brain, and partly because the case itself was paced well throughout the episode and made for a nice story flow. Featuring a Jackass-style web show about crazy stunts and rude pranks feels about 10 years out of date, but it’s entertaining enough to overlook, especially when Liv is doing things like stapling her forehead while Clive looks on in horror. (Let’s face it, most of the cases of the week are an excuse for Liv to act weird and Clive to make funny faces, and that’s okay.) A murder victim who spends much of his life filming things and then dies on camera also allows the show to reveal bits of the case through different means than just visions and interrogation scenes, which is a welcome variation. In the end, the reveal that it was the producer who killed Finn because Finn played a prank on him that involved sleeping with his girlfriend—who then had Finn’s baby—wasn’t a huge shocker, but it was plenty satisfying enough. In an episode so full of other juicier, more complicated plot turns, it was just the right palate cleanser. Because this episode wasn’t busy enough already, Liv and Justin also went on their first date. It was rather cute and Justin is great, so I guess we are supposed to forget all of Liv and Major’s moments from just two episodes ago? I don’t know about that. DA Baracus running for mayor will surely be important in the future. I love how they use recurring characters to build the universe. Even the newscaster heard in the background at the beginning of the episode was obviously Johnny Frost’s voice. We never saw Vivian actually die! By soap opera rules she is definitely still alive and plotting her return! There was another Veronica Mars alum here aside from Jason Dohring: Robert Ri’chard, who played Mason in several season three episodes. Ravi and Liv trading (terrible) accents is my love language. Letting Rose McIver’s real hair and skin tone come out to play for her “undercover” mission was fun. “Don’t worry. 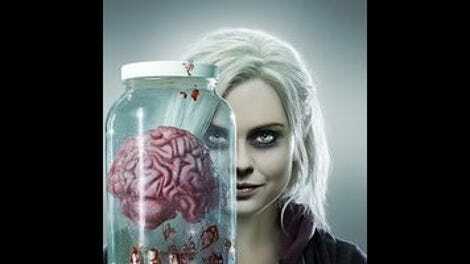 He’s alive and… well.” Never say iZombie isn’t afraid to embrace any and all puns.